It was a cold, cold, cold weekend here in Spokane. The temperature never got above freezing and it was usually right around 15°! So I decided I really needed to get going on the mittens. And last night I finished the 25th pair while watching a marathon of Hallmark channel Christmas movies. This morning I delivered them to the school and they had me take them right outside to the playground and put them on some of the children's little hands. Boy! That sure made me feel good. And they gave me a count on the other first grade classes. I have about 70 more pair to make when I get home from Mandy's. This is what I took to the school this morning. 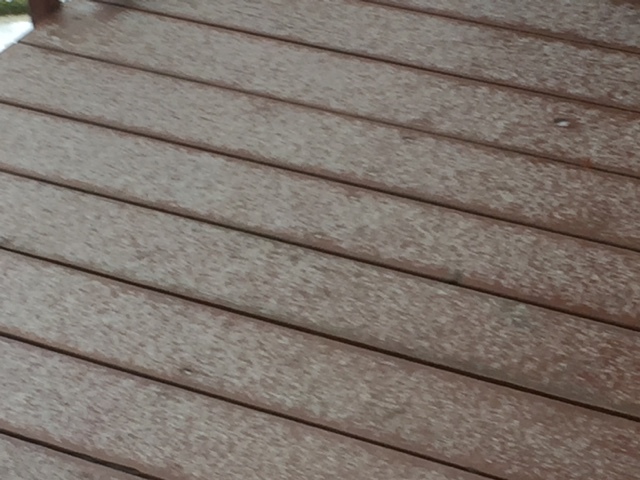 We got another small dusting of snow yesterday. 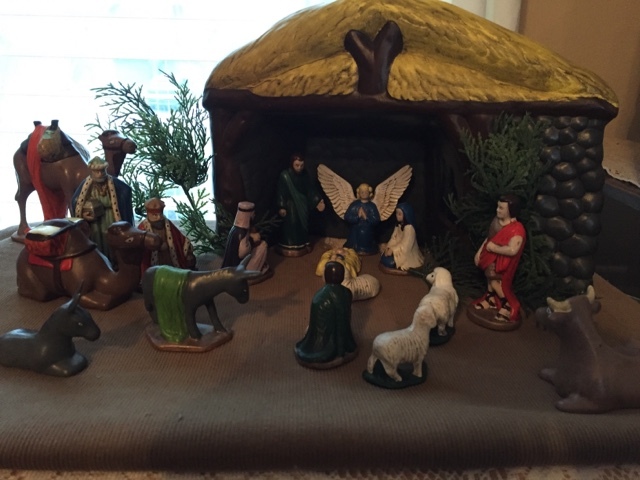 The nativity that I made for our first Christmas together was put out on Saturday. It's amazing to me, 37 years and so far nothing has gotten broken yet! 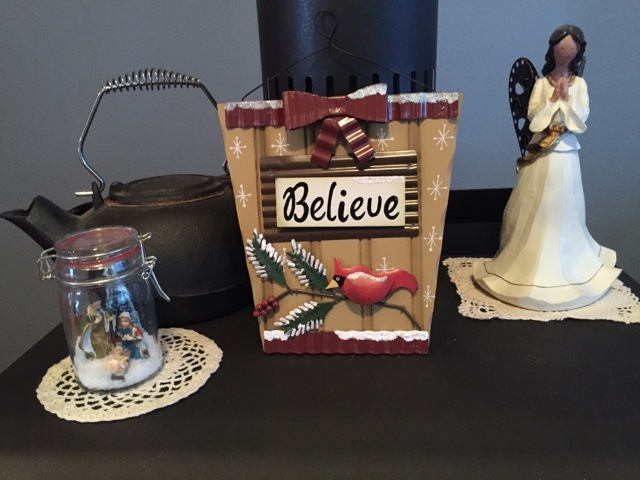 Not many decorations were put out this year since we won't be home for a lot of the season and, quite honestly, without the kids here I just don't have the heart for it. But a few of my favorites were put out for display. Teresa, (over on my side bar), made this for me. Isn't that sweet? It sits out year round. And this little girl is the reason that I'm flying for hours and hours and hours tomorrow. I get to hug her and kiss her good night tomorrow night. And sing songs. Lots and lots of songs. I have to be up by 3:30 in the morning to go to the airport. I have a 1 hour flight to Seattle and then a nonstop flight from Seattle to Baltimore. 6 more hours! She's well worth it though isn't she? Too bad grandpa has to stay here and work. He'll fly out next week and join me for the second week of our trip. And Ellen will be staying at our house with Chloe so she won't be left alone either. Seriously, it will be good to see Mandy and Brad too. It's so hard having them all so far away. 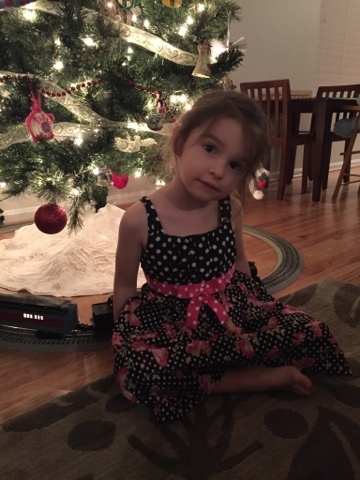 This is a picture of Piper after they put their tree up on Saturday and put the Polar Express train around the bottom. Her and Daddy love to put up the Polar Express. It's their thing that they do together. Have a lovely week my friends. And remember the reason that we're celebrating the season. The One who came, gave His life for us, so that we can live again with Him forever. "But thanks be to God. He gives us the victory through our Lord Jesus Christ." Betsy.. I'm so impressed with your mittens you've made! Dayle and I are going to send you a check for you to buy more yarn.. we'd like to help you help the kids. 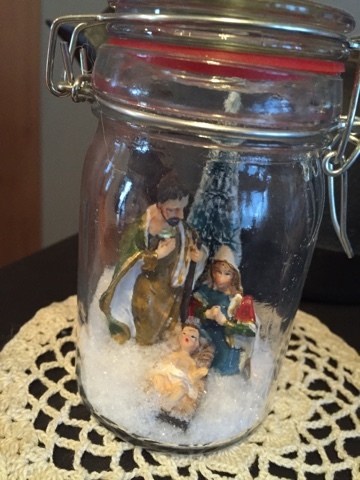 I'm so pleased that you love the little Nativity snow jar I made for you. You're so sweet. I'm happy that you get to go spend time with your darlings.. have a safe flight.. I bet you will get a few more mittens knitted on the flight! We Wish You a Merry ♪♫•*¨*•.¸¸¸¸.•*¨*•♫♪ Christmas♪♫•*¨*•.¸¸ ¸¸.•*¨*•♫♪ We Wish You a Merry ♪♫•*¨*•.¸¸¸¸.•*¨*•♫♪Christmas We Wish You A Merry ♪♫•*¨*•.¸¸ ¸¸.•*¨*•♫♪Christmas♪♫•*¨*•.¸¸ ¸¸.•*¨*•♫♪...And A Happy New Year!♪♫•*¨*•.¸¸ ¸¸.•*¨*•♫♪..
You have such a generous heart, a thoughtful gesture for children in real need. Hope you have a wonderful time with your beloved family. Safe travels. I like all thee mittens so much. It's so cool that you can knit fast ans such pretty things. Besides I think you're a good person if you did them for others. That's a generous thing. Wonderful post with extra special delights Betsy, I know you'll enjoy your next two weeks, very pleased for you. And well done on the mittens almost three times that to come, what a marathon. May God bless your hands as you make them dear sis. First of all once again I have to say you are an angel for making all of those mittens. I just sent a box of socks to Pine Ridge Indian Reservation, they were on sale at Target for $1, I could not pass that up. I bought everyone they had in the bin. So happy you are going to see both of your girls tonight. That is the best! And little Piper will be beside herself excited. I'm late to the party, as usual. I hope you had a safe trip and that you are hugging Miss Piper as I write this. Those mittens are wonderful. You have, as I've said before, such a kind heart and I am proud to call you my blogging friend. Enjoy your time with Piper, Mandy and Brad. I have a box of yarn to send you but I will wait until after the first of the year. Thrilled you will celebrate Christmas with family!!!! enjoy their decorations! 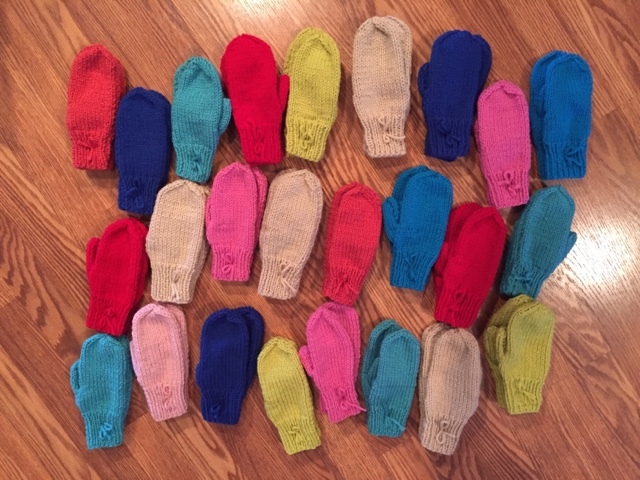 Have a wonderful time and look at all those mittens!!!! A Polar Express train would be great! I got the book for my youngest when he was little. Merry Christmas!